Whether you’re getting ready for warm weather or planning an outdoor event, ALEKO brand electricity-free retractable awnings provide shade and protection without having to worry about cumbersome electric devices. ALEKO awnings are powered by a simple hand crank and are easy to unfurl in less than a minute, giving you more time for outdoor fun and relaxation! Made of 100% Polyester the patios are completely shielded from sun and rain. All ALEKO awnings come with standard vertical wall brackets. 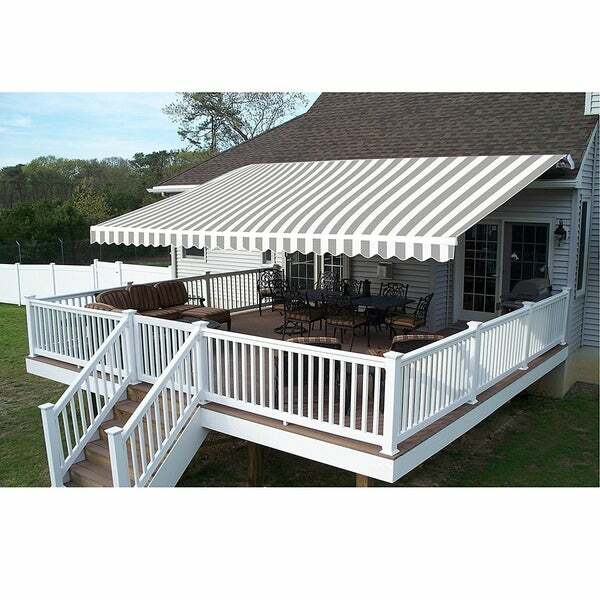 The awning can be used on its own or with two strong, reliable support arms (sold separately) that can be installed vertically on a deck or patio floor, or angled against your house wall. "how much are the roof brackets? where do I find them? " "What UV protection does the awning provide? Thank you in advance!" "The picture shows the unit mounted on the roof. Does the equipment come with brackets for roof mounting?" The awning comes with wall brackets. Ceiling brackets are available for additional price.